I’ve been brainstorming some ideas for regular blog posts and one that I came up with is “Make Ahead Mondays”. If you haven’t discovered the beauty of the make ahead meal, thank you for allowing me to be the person who changes your life. Life is busy. Life is exhausting. With two working parents in our house, who’s got the time or energy to put together a meal when you get home from work? No one. Yet, we’ve made the decision to cut down on all the processed junk in our lives and make healthful meals from scratch as much as we can. So…the solution to our problems has become make-ahead meals. We do just about all of our cooking on the weekend so that all we have to do the night of is heat it up! Most meals can also be frozen so we often make double-batches and freeze whatever we can for an even easier week. I am from the upper-midwest and one thing we are famous for is HOTDISH! Not casseroles, hotdish! My mother-in-law on the other hand IS known for her cooking. Good old-fashioned North Dakota comfort cooking. She’s the only woman I know who always has heavy cream in stock in her refrigerator. I thought it only appropriate to kick off my Make Ahead Monday project with a recipe from one of my favorite ladies. 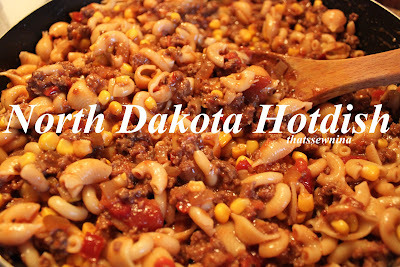 They actually call this “Funeral Hotdish” in North Dakota since it can easily be made in large quantities. Please pardon the title change but I thought folks outside the know would prefer to serve "North Dakota Hotdish" over something with "funeral" in the title. We’ve tried freezing it but the pasta doesn’t thaw really well. However, it actually gets better after a few days in the fridge so it makes for a great make ahead. AND some small pasta shells this time around. not intentional. I just ran out of elbow mac and it worked out just fine! the secret key in our house is using "Amma's tomatoes"
Looks delicious. I will have to give this one a try. Have to smile at the whole "funeral" angle though. I was asked to make a salad for a funeral at my church and discovered the genre of funeral foods up here in the Midwest: jello salads and hot dish. Love it! So true, Jen! There's something special about the Midwest and large gatherings where food is involved. TO MY FAVORITE DAUGHTER IN LAW OK SHE'S THE ONLY ONE BUT SHE'S STILL MY FAVORITE. THANKS FOR THE CUDOOS MY RECEIPE CAME ACTUALLY FROM MY MOTHER IN LAW AS DID A LOT OF MY DISHES SHE WAS ONE HELLVA COOKER / BAKER WOMAN AND A SUPER MOTHER IN LAW . SHE WAS ALSO A VERY GOOD FRIEND TO ME ALSO. YOU HONOR HER IN A MODERN WAY I'M SURE SHE'S SMILING. Mmmmm, my mom makes this too! But without the corn, and more ketchup! LOL! Makes me hungry! From North Dakota myself! Looks delicious! In Nebraska, we just call this goulash. I grew up with it as did all of the people I know from here. My mom always just adds whatever veggies she has on hand. I think I need to make this for supper! This is just a great base for experimenting. It's beautiful because it turns out different every time. I once added kidney beans and seasoned with cumin and chili powder and my wife thought it was the greatest thing ever. Grew up eating this & it's a family favorite for my brood. I prepare it in the morning or the night before and put it in a casserole dish, when it comes time I heat it in the oven with shredded cheese on top (we like the crunchy pieces along the edges)!